Take an overnight train from Tehran to Shiraz, spend some time in the restaurant car with the locals and learn about life in the fascinating culture. Explore the rich history told in the ancient ruins that lie across the country. Modern Iran is a great fusion of civilisations – the Archaemedians, Alexander the Great, the Parthanians, Sassanians, Arabs, Seljuks, Mongols, and Safavids – who all left their mark in innumerable ways. Experience the wondrous remains of the ancient capital of Persepolis – the scale and grandeur will leave you in no doubt that this was once the centre of the known world. Immerse yourself in rural nomadic life with a beautifully remote homestay with the Qashqai people. Surround yourself with beautiful landscapes and amazing architecture – from breath-taking mosques to stepped hillside villages, cleverly designed wind towers and the macabre Zoroastrian Towers of Silence. Slip into the exotic shoes of a Silk Road merchant with an overnight stay in a classic 16th-century Caravanserai. Welcome to the hidden world of Iran. Travel through this fascinating country to discover refined Islamic cities, colourful bazaars, ancient Persian ruins, fascinating nomads and shimmering deserts. Whether you're relaxing in a teahouse in Tehran, enjoying guided tours of ancient cultural sites, or breaking bread with nomads on the harsh Iranian plateau, the warmth and hospitality of the Iranian people is endearing and the profound beauty of their land is mesmerising. I wasn't really impressed with the guide. I was pleased she was female and that she was local but she spoke indistinctly at times and, if challenged, could be sulky. I felt some of the hotels were pretty ropey. PS, I forgot to add that on many occasions, despite the fact that they did not form part of the tour, we were marched to tourist trap restaurants and forced to buy a buffet when people would have preferred to choose their own lunch. Not having all meals included was an attraction for me as my general preference is to travel independently. Your own trip notes say, rightly, that this freedom allows clients to budget. However, on a number of occasions we ended up like an elderly tour group on tourist traps and that was really unsatisfactory. The restaurant near Persepolis and the one leaving Shiraz stand out in particular, as does the fact that the travel on each of those days could have been organised to allow us eat wherever we wished in Shiraz. It all smelled of kick backs to be honest, and not what I would expect from Intrepid. The guide and itinerary were excellent. The only exception was a down day in Eghlid. The Iranian people were some of the friendliest, open and accommodating, that I have encountered. Iran is a remarkable destination. Nadia was an exceptional leader. She ticked every box. She was knowledgeable, organised, personable, communicative, enthusiastic, fun and thoroughly professional. Welcome to Tehran! Iran's capital is exciting, noisy and chaotic. Home to 15 million people, Tehran is the country's beating heart and where its true national identity is found. Expect to see women wearing full-length chadors competing for space with young and hip girls in figure-hugging manteau and headscarves. You will be met on arrival at Tehran International airport and transferred to your hotel. There will be a welcome meeting at 6 pm today. Please refer to your hotel noticeboard or talk to reception for more details. If you can't arrange a flight that will arrive in time, you may wish to arrive a day early so you're able to attend. We'll be happy to book additional accommodation for you (subject to availability). If you're going to be late, please inform the hotel reception. We'll be collecting your insurance details and next of kin information at this meeting, so please have this on hand. After the meeting, you could try some fine Iranian cuisine like dizi (soup stew mashed into a paste) while enjoying traditional music at a local restaurant. Discover Tehran on a walking tour with your local leader. Visit the World Heritage-listed Golestan Palaceis, an opulent masterpiece of the Qajar era, decorated with beautifully painted tiles and set around an elegant garden. 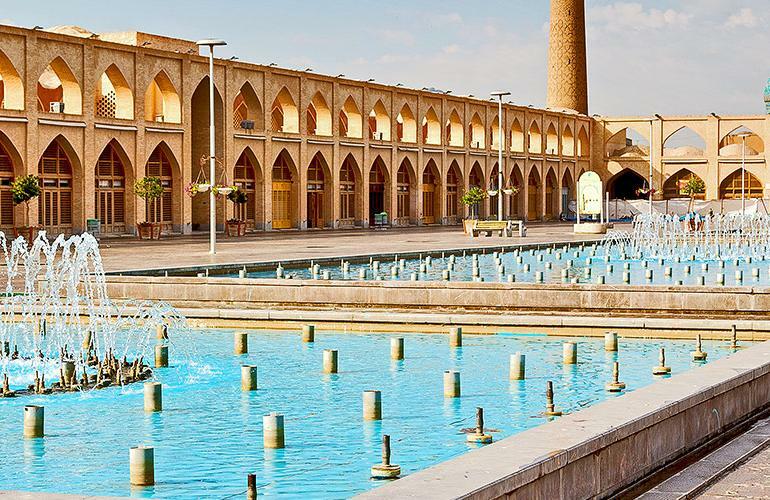 Then, swing past the Imam Khomeini Mosque, an early-18th-century complex and one of the city's largest and busiest mosques. Check out the labyrinthian Tehran Grand Bazaar, before heading back to the hotel in the afternoon. Take advantage of one of the day rooms to refresh yourself before boarding your overnight train to Shiraz. Arrive in Shiraz in the morning and transfer to your hotel. Have breakfast, freshen up and then hit the town in a walking tour of ‘the Pearl of Persia’. Shiraz is a city of poets and gardens, and has been considered the centre of Persian culture for thousands of years. Lavish mansions, colourful woollen rugs, art, philosophy, poetry – Shiraz is full of Iranian romance. Stop first at Shahcheragh – the holiest site in Shiraz. This glittering mosque and funerary monument is a popular pilgrimage site, sure to impress even non-believers with its beauty and grandeur. Then, visit the Jame Atiq Mosque, parts of which date back to the 9th-century. Finish the tour with a stop at a traditional teahouse in bustling Vakil Bazaar, where merchants peddle textiles, jewellery, spices and clothes. Just an hour away from Shiraz lies the ancient city of Persepolis. Once the centre of the Persian Empire and one of the great cities of the ancient world, Persepolis was constructed during the reign of Darius I and took 150 years to complete. The imposing gateways, exquisite relief carvings and towering columns still impress today. Enjoy a guided tour of this splendid and somewhat mysterious ancient city. The rest of your afternoon is free for you to explore Shiraz at your own pace. If feel like some peace and quiet, consider wandering among through colourful flower beds in the Eram Gardens, also known as the ‘Garden of Paradise’ (Bagh-e Eram). Perhaps get a sense of Iranian national identity past and present in the tomb of Hafez – a 14th-century poet and folk hero considered by many to be Iran’s greatest artist. More contemporary, but still lovely, is the tomb of Saadi, another eminent Persian scholar whose work is still renowned in Iran today. In the centre of town, you will find the Arg-e Karim Khan, a sturdy mud-brick citadel from the 18th century. Although it is most impressive from the outside, the room exhibiting historic photos from the 19th and 20th century is worth checking out. In the evening, Meet up with your group in the early evening as we join locals Shirazi's for dinner. Enjoy a free morning in the ‘City of Flowers and Nightingales’, which has managed to retain its provincial, relaxed atmosphere and is a lovely place to explore. If you are an early riser consider checking out the Nasir al-Mulk Mosque, with your local Leader undoubtedly the best time to experience this astonishingly beautiful mosque is in the early morning light. In the afternoon, journey into Fars Province to meet your nomadic hosts. The barren landscape sits in stark contrast to the vibrancy and hospitality of its inhabitants. Iran is home to around 500 different nomadic groups. The largest, the Qashqai, are Turkic speaking pastoral nomads who winter near the Persian Gulf and summer on the central Iranian Plateau. For many, migration is still a way of life, though some traditionally nomadic communities are now settled in villages scattered throughout the region. Spend the evening with a Qashqai family in one such local village, sharing a meal, stories and songs with your hosts. Say farewell to your desert hosts and journey towards the town of Eghlid. In ancient Persia, Eghlid acted as the main gateway from the north to Persepolis, as other routes were too mountainous and difficult to pass. Check into your hotel in this sleepy town, then head out to explore the ruins of the Sassanid Empire, including the shrine of Eghlid and the ‘Towers of Silence’. Part of Zoroastrian tradition, the towers are raised circular structures where the dead were laid out to be picked clean by scavenger birds, lest the body be contaminated by evil spirits. Zoroastrianism, which dates back over 4000 years, was the state religion of Iran before the arrival of Islam. Followers believe there is one God called Ahura Mazda (Wise Lord), and they worship communally in a Fire Temple or Agiary. Travel one hour to the desert-valley town of Abarqu, tucked under the Zagros Mountains. 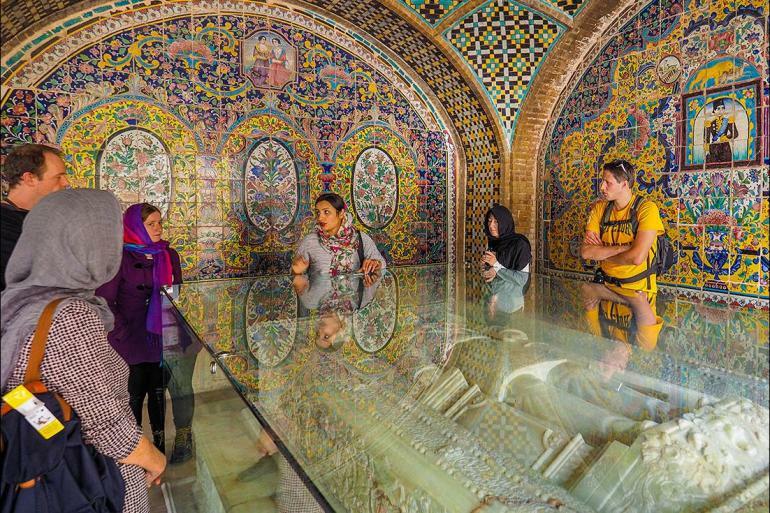 Spend a little time checking out the many historic local sights, including an ancient ice house (a passive refrigerator), the 11th-century Gonbad Ali Dome, the Qajar-era mansion Khan-e Aghazadeh, the Jameh Mosque, and a 4000-year-old cypress tree. Continue to Yazd, arriving in the late afternoon. This ancient desert city was a major stop on the caravan routes to central Asia and India during the Silk Road period – Marco Polo even visited the city on his way to China – and it retains a rustic feel to this day. Check into your hotel and get oriented with a leader-led walk around the city. Later, maybe ask your leader where to go for the best local sweets. Yazd is well-known in Iran (and around the world) for a wide variety of confectionary featuring plenty of nuts, rosewater and flaky pastry. Set out on a walking tour of this fine city, stopping first at the local Jameh Mosque, notable for its fine mosaics and beautiful exterior. From here you are ideally placed to explore the older parts of the city, which scholars believe to be the oldest adobe (earthen material) city on earth. Walk through narrow kuches (lanes) and past simple courtyards, snapping shots of the ornate doors set into mud-brick buildings. One of the most distinctive features of Yazd are the wind towers (‘badgirs’) that capture even the softest of breezes and send them to the buildings below, an ancient form of a air conditioning. Learn how underground water channels kept the city hydrated with water from the mountains at the Water Museum. Stop in at the local Fire Temple and Towers of Silence, both vestiges of the city’s Zoroastrian heritage. In the Zoroastrian religion, fire and water are agents of ritual purity, and the fire in the Atashkadeh Fire Temple is said to have been continuously burning since AD470. Join an optional morning excursion outside of Yazd, including stops at the impressive Kharanak mud-brick village, Chak Chak fire temple, and the Meybod citadel. The impressive town of Kharanak is believed to be 1000 years old, and you can explore the abandoned structures of this hillside settlement, peering into the houses of wealthy merchants and hammans (bathhouses). If you choose to participate in this excursion, you will also explore the valley and nearby mountains. Wonder at the ancient irrigation system and water ducts, still used to irrigate the fields – great shocks of green that sit against the brown desert. Chak Chak is one of the most important Zoroastrian pilgrimage sites in Iran, and you’ll climb up the mountainside to reach the fire temple – your efforts rewarded with wonderful views. Chak Chak means ‘drip, drip’, named for a trickle of holy water that drips inside the temple. If you're after a more relaxing day, then you can simply stay at the hotel – a traditional 19th-century mansion – puff on a qalyan or try the local favourite, camel fesenjun, in the shady courtyard.In the afternoon, conitnue to Zein-o-din Caravanserai. Set in the desolate Dasht-e Lut desert, Zein-o-din is a classic caravanserai (desert inn) built during the 16th century. A night's stay in a caravanserai is a wonderful chance to step into the exotic shoes of a Silk Road merchant and relive the age when this area hummed with travellers. Most of the rooms remain unchanged from days gone by, with carpets covering raised wooden floors, and heavy curtains rather than doors separating rooms from the hallway. Like Silk Road travellers before you, experience a rich red sunset while the night sky fills with stars. Rise and shine for an early, authentic breakfast of freshly baked bread. Then enjoy free time to bask in the sunshine on the rooftop, overlooking the barren landscape of the surrounding desert plains. Then, make the 5-hour journey to Esfahan. A 16th-century rhyme described Esfahan as 'half the world' and after spending a few days here, you might be inclined to agree. There's an abundance of fine Islamic buildings, most of which are covered with the blue mosaic tiles Iran is famous for. When the sun goes down, local people gather to talk, drink tea and sing beautiful folk songs at several of the cities bridges, on arrival in the early evening we make like the locals and take a walk by the river to check out the Khaju Bridge. Soak up the atmosphere of Esfahan during a half-day tour of the city. Your leader will give you some insight into life under Persia's greatest ruler, Shah Abbas, who ruled Esfahan when it became the capital of Persia during in the 16th century. Begin the tour at the immense Imam Square (formerly Naqsh-e Jahan Square), which covers an area of 82,500 square metres and is surrounded by by many grand buildings, such as the Ali Qapu Palace, Sheikh Lotfollah Mosque, Qeysarieh Portal and the majestic Imam Mosque. Travel west of Imam Square to the Ali Qapu, a visually fascinating palace used by Shah Abbas to receive guests and foreign ambassadors. Visit the atmospheric local bazaar, taking in the heady smell of spices and the sound of merchants' cries. Walk the covered lanes of this sprawling marketplace, where shafts of light filter through celling and lattice, and browse for fabrics, jewellery and other treasures with the locals. This morning, take a walking tour of the Christian-Armenian quarter of Esfahan with your leader. This area of the city, known New Jolfa, was established by Shah Abbas I In the early 17th century. The Shah transported over 150,000 Armenians from a town in what is now Iran's northern border, offering them an oasis of religious freedom in exchange for their contribution to the economy and culture of Esfahan. Choose to visit the stunning Vank Cathedral, the Manar Jomban (Shaking Minarets) and or the Chehel Sotun Palace in your free time. Your tour Leader will have plenty of suggestions. Enjoy a late start this morning before our departure back to Tehran. A full afternoon of travel awaits, so make sure you have some snacks and a good book or two to keep you company. You will arrive in Tehran at around 6pm in the evening. If you have the energy following check in, perhaps head out for a final orange blossom tea or late dinner with your fellow travellers. There are no activities planned for the final day and you are free to depart at anytime. Please note you must check out of the hotel by 12 pm. Guides All group trips are accompanied by one of our group leaders. The aim of the group leader is to take the hassle out of your travels and to help you have the best trip possible. We endeavour to provide the services of an experienced leader however, due to the seasonality of travel, rare situations may arise where your leader is new or training other group leaders. Your leader will provide information on the places you are travelling through, offer suggestions for things to do and see, recommend great local eating venues and introduce you to our local friends. You can expect them to have a broad general knowledge of the places visited on the trip, including historical, cultural, religious and social aspects. In Iran, in accordance with local regulations your Leader will also be a licensed Tour Guide and will not only have a broad general knowledge of the places visited on the trip; but will also have specialised knowledge on the sites visited and provide full guiding services.